German Middle Ages Sword | BUDK.com - Knives & Swords At The Lowest Prices! This is an outstanding historical collectible at a truly unbelievable price! This classic German sword is patterned on a typical Medieval Age design. 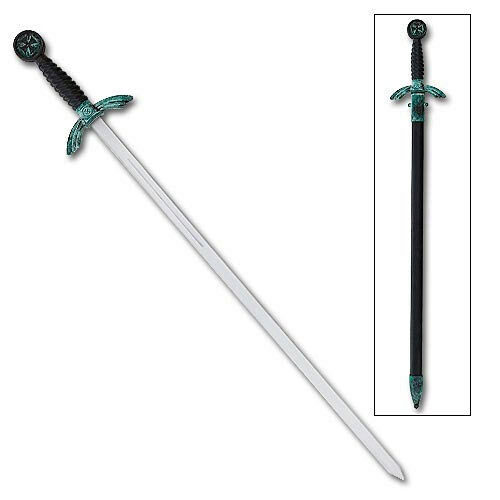 It measures 30 3/8" overall and features a cast metal guard and round pommel branded with an iron cross. The 23" mirror polished blade is constructed from stainless steel and contains a narrow blood groove in the upper portion of the blade. This item includes a custom black blade sheath. This is very nice addition to your historical collection!